Perched atop a bluff overlooking the harbor, the restaurant at Friday Harbor House is the perfect place to enjoy a delicious meal or happy hour with friends and family with breathtaking views. The only thing that could make the views from Friday Harbor House better is more space to enjoy them. 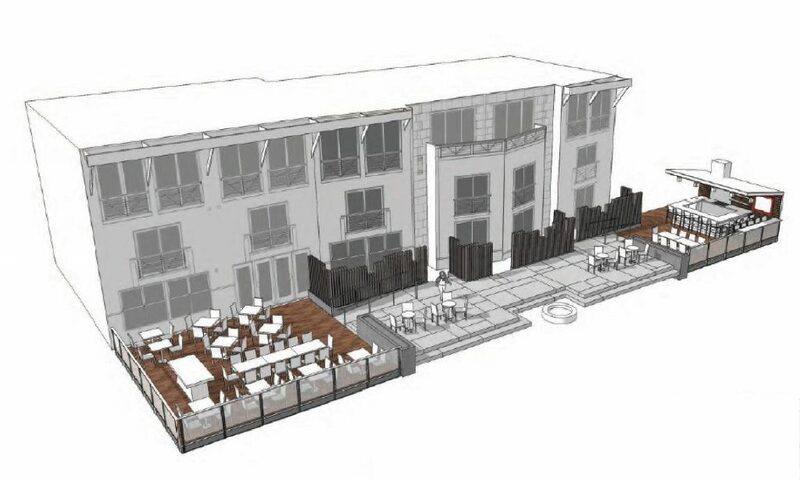 Construction on an expanded, upgraded outdoor deck at the restaurant at Friday Harbor House is underway and on schedule to be completed by the beginning of May. Designed with a focus on enhancing guest dining experiences, the deck will feature comfortable seating, a fire pit, and outdoor event space. With over twice as much available outdoor dining space at the restaurant, there will be plenty of room to revel in Friday Harbor House’s stunning San Juan Channel vistas and feast on Chef Jason’s delectable Northwest fare. The new deck will inspire new menu items and craft cocktails for you to enjoy. So start dreaming of those sunny summer days out on the new deck soaking in the sunshine while watching boats go by in the harbor. Or on those more chilly nights, sip on cocktails by the fire pit. The new deck will offer more event space for special events, gatherings, weddings, and celebrations. View a sneak peak below.